Located in Sioux City, Iowa, St. Luke's College is the region's smallest and most unique institution of higher learning. 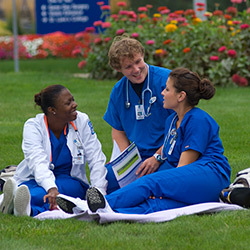 St. Luke's College is a private, non-profit institution that has been committed to educating knowledgeable, competent and compassionate healthcare professionals for nearly a century. More than 2,800 alumni from St. Luke's College are now employed in a variety of healthcare positions throughout the community and nation. Predating all but one of the area's post secondary institutions, St. Luke's traces its earliest roots back to the late 1890's with indirect ties to Samaritan Hospital School of Nursing. St. Luke's College is also directly linked to two schools of nursing that were established in the first quarter of the twentieth century, Lutheran Hospital School of Nursing, established in 1902 and Methodist Hospital School of Nursing, established in 1920, both of which provided nursing education continuously until 1967. In 1966 the schools' sponsoring hospitals merged to create St. Luke's Medical Center (now UnityPoint Health - St. Luke's). The Board of Directors of the newly established Medical Center demonstrated their ongoing commitment to nursing education by merging the two schools and establishing St. Luke's School of Nursing. Since then additional degree and certificate programs have been added, beginning with allied health sciences in 1993. In 2001 the college's Board of Directors authorized the change of the institution's official name to St. Luke's College. The college's educational values, beliefs and foundation have been built upon for more than one hundred years by preparing nurses and healthcare professionals for careers involving selfless service to others in their time of need. St. Luke's College is proud of its excellent reputation for preparing graduates to pass national licensure examinations and to practice as registered healthcare professionals. The long-standing tradition of providing quality healthcare education in a hospital setting continues for St. Luke's College, which now offers bachelor's degrees, associate degrees and certificate programs.